Premium Compatible Label Tapes for the Brother P-Touch 300 printer. Brother P-Touch 300 is a monochrome label printer that works fine for both home and small office users. It is a labelling machine based on direct thermal printing technology with basic features offered at reasonable price. As this label printer uses label tapes, therefore the running costs are reduced. The printer comes with a relatively small footprint that measures 17.4 cm in width, 20 cm in depth and 6 cm in height. The weight of the device is 0.7 kg which is comparatively heavier. The LCD display offers the user with easy to read editing before printing the labels. And, the Qwerty keyboard is fitted with 49 keys. The cutter provides cuts that appear professional. Additionally, the device supports 5 line printing, prints the labels at a speed of 23.6 inch in one minute and carries out a repeat printing up to 9 copies which saves a lot of time. Print resolution is 180 dpi which is same as other advanced Brother labelmakers. Plus, the display resolution is 1 line × 4 characters. Further, label printing works only with one font that is Helsinki. The Labelmaker supports Brother P-Touch 300 Label Tapes that are TZ laminated type. Non laminated tapes are incompatible. Lastly, the printer is connectable with personal computers via USB port. Brother P-Touch 300 printer is a basic printing machine good enough for non-colour printing needs in home and small office. If you need a typical label printer at a cheap price this machine would make an ideal choice. Q. What range of widths are available for Brother P-Touch 300 label tapes? A. Brother P-Touch 300 label tapes are available in four types of width: 1/4inch(6mm), 3/8inch(9mm), 1/2inch(12mm) and 3/4inch(18mm). 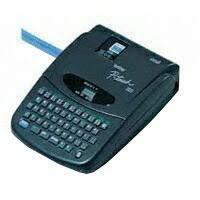 Q. I need to replace the tape casette in my Brother P-Touch 300 machine. Could you please help as I have never replaced it before? To advance the tape, you need to press and hold the CODE key along with the FEED key for one time. Please Note - While inserting a tape cassette be careful with the inner ribbon. It should not get stuck on the corner of the metal securing stand. The release lever/white lever locks automatically when the compartment cover is closed. If you try to operate the release lever manually the cover cannot close. So, you need to be careful with the cover before you replace the tape cassette. Q. How much life can I expect from a cutter unit? Because after using it for about 6 months the blades in the cutter unit are not cutting the Brother P-touch 300 label tapes correctly. A. The life of the cutter unit is expected to provide approximately 2000 cuts. If the blades are incapable of cutting the label tape you will have to replace the cutter unit. Q. My previous labelling machine from Brother had an automatic power off feature that lead the machine to turn off if not used for more than 5 minutes. Plus the machine also had the facility to retain the last message created on the display after it was turned off. Are these features available in Brother P-Touch 300? A. Yes. The Brother P-Touch 300 printer has an automatic power down feature which enables the machine to shut off automatically when not used for five minutes. This feature adds to the efficiency offered by the printer. The printer also has the capability to retain the message created just before you turned off the machine. The message is displayed on the screen as soon as the machine is turned on. The message remains in the memory storage until the printer is turned on again. Q. Apart from VAT, do the Brother P-Touch 300 label tapes prices mentioned on your website include the delivery charges? Or do I have to pay separately for the delivery? A. No. The price mentioned on each Brother P-Touch 300 label tape does not include the delivery charges. The delivery charges depends on the order for which you can visit the ‘DELIVERY’ section below. Q. I have recently purchased Brother P-Touch 300 printer and I am getting blurred characters printed on the labels. What is the matter? A. If the printed characters are blurred or not printed properly then the tape cassette might not be inserted correctly or the tape cassette might have gone empty. If it has gone empty you will need to replace it. Another important factor to consider is the appropriate character size. If the character size has been selected to greater than the width of the tape than these kinds of issues may occur. Hence please make sure everything mentioned above is in the right place.